An efficient and broad-spectrum protocol for cryopreservation of Vitis spp. shoot tips by droplet-vitrification is reported. 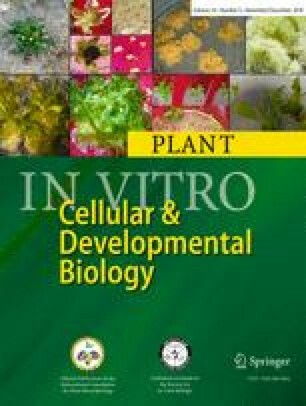 Shoot tips (1.0 mm) containing 5–6 leaf primordia (LPs) were precultured for 3 d with a preculture medium containing 0.3 M sucrose, 0.16 μM glutathione, and 0.14 μM ascorbic acid. Precultured shoot tips were treated for 20 min at 24°C with a loading solution composed of 2 M glycerol and 0.4 M sucrose, followed by exposure at 0°C to half-strength plant vitrification solution 2 (PVS2) for 30 min, and then full-strength PVS2 for 50 min. Dehydrated shoot tips were transferred into 2.5-μL PVS2 carried on aluminum foil, prior to a direct immersion in liquid nitrogen. With this method, an average shoot regrowth level of 50.5% was obtained from cryopreserved shoot tips in six V. vinifera genotypes (three wine cultivars, two table cultivars, and one rootstock) and two V. pseudoreticulata genotypes. Vegetative growth of the regenerants recovered from cryopreservation, significantly increased as the number of subculture cycles increased and was greater than the control after the third subculture following cryopreservation. Inter-simple sequence repeats (ISSR) and random amplification of polymorphic DNA (RAPD) analyses did not detect any polymorphic loci in the plants of V. vinifera L. cv. ‘Cabernet Sauvignon’ from cryopreserved shoot tips compared to the original cultures. This droplet-vitrification cryopreservation method provides a technical platform to set up cryobanks of Vitis spp. Wen-Lu Bi and Xin-Yi Hao contributed equally to this work. W-L Bi and X-Y Hao: performance of experiments, data collection and analysis, and preparation of the manuscript; Z-H Cui: preparation of plant materials and assistance to data collection and analysis; GM Volk: valuable discussion and English editing; Q-C Wang: chief scientist, experimental design, financial support, and preparation of the manuscript. This work received financial support from State Forestry Administration of China (project no. 2013-4-41) and from Department of Science & Technology of Shaanxi Province of China (project no. 2013KTCL02-01).